‘A Little History of the Dublin Pub’ opens on 1 June and will run until 24 September. THE IDEA OF the pub, as we know it today, really only came into being during the Victorian era. At the opening of the 19th century, most pubs in Dublin – and elsewhere – were really just places that alcohol could be purchased. And people imbibed in their own front rooms. The major shift in Ireland came as the Licensed Vintners Association (LVA) was founded in 1817. Its aim was to provide a high quality of pub and brewing in Dublin. Its establishment followed larger brewers taking over the home brewing industry that existed in Ireland for many years. From that time, 200 years ago, publicans started building premises with features that are distinctive to what we know as a ‘pub’ today – the fine wood carvings and stained, polished glass, to intricate mosaic tiling. Next week, the Little Museum of Dublin is launching a new exhibition to celebrate the history of such pubs in the capital. ‘A Little History of the Dublin Pub’ opens this Thursday, 1 June and will run until 24 September. The exhibition celebrates the 200th anniversary of the LVA and tells the story of Dublin’s public houses from before the Victorian Era until today. One of the most iconic elements of Irish culture, Dublin pubs have evolved throughout the centuries – from their origins in front rooms and kitchens of Dublin homes, to the Victorian era and today, the modern bars. The exhibition will put a particular focus on the Victorian era pubs in Dublin. “The Victorian pub was a conscious decision to improve the standards and the quality of the experience,” Jesse Carley, assistant to the director of The Little Museum of Dublin, told TheJournal.ie. [Before] they were just rooms with a counter, they didn’t have very much in the way of lighting, seating or lavatories. “There’s a little bit of each of those pubs in the exhibition but then it’s also a celebration of Dublin pubs in general,” Carley adds. We have a little bit on many of the pubs you would think of, such as the Brazen Head, the oldest pub in Dublin and the wide variety of different kinds of pubs. He explained that the architectural features of Victorian era pubs are what made them so distinctive. They were also the first places people drank outside of their own homes, the kitchens of the people brewing and selling, or premises with plain counters (like off licences). The exhibition celebrates the place Dublin pubs have in Irish society and explains how it achieved that style. “It’s also a celebration of Dublin pubs in general. We have a little bit on many of the pubs you would think of, such as the Brazen Head, the oldest pub in Dublin and the wide variety of different kinds of pubs,” Carley said. The Council of the LVA will attend the launch of the exhibition to get the first look, before it opens to the public. Email “From the front room to The Long Hall: The history of the Dublin pub”. 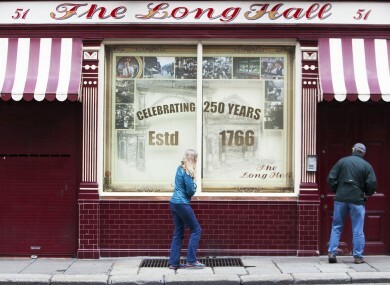 Feedback on “From the front room to The Long Hall: The history of the Dublin pub”.